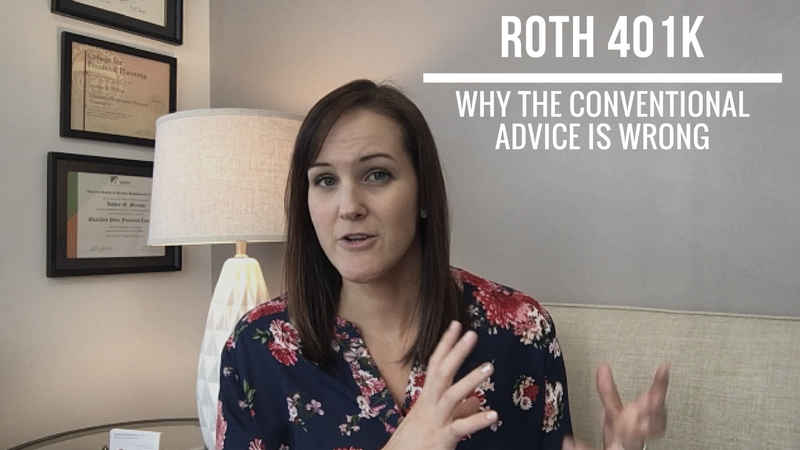 In today’s video blog, we’re talking about why you should contribute to your Roth 401k (even if you think your income is too high) and why the conventional advice on Roth 401(k)s has it all wrong! The conventional advice around whether you should or shouldn’t contribute to a Roth 401(k) goes something like this: If you think you’re going to be in a higher tax bracket in retirement, then you should contribute to a Roth, because if your taxes are higher and you’re pulling out that money tax-free in retirement, you’re not going to pay taxes. If, on the other hand, you think that you’re going to be in a lower tax bracket in retirement, then it might be a good idea for you to contribute to a traditional 401(k). Why aren’t you contributing to your Roth 401(k)? In conversations with our clients & business owners that I talk with, so many of them are not contributing to their Roth 401(k) option. If you’re a small business owner and you have a 401(k), that’s great. You most likely have a Roth option. If you don’t, you should add one right away. Even when you already have the vehicle that exists, why aren’t we taking advantage of it? The reason I think is twofold. First of all, a lot of business owners aren’t really aware that they actually can contribute to the Roth 401(k). A really common misconception is that you have income caps on what you can contribute to a Roth. That’s actually true, but it’s only true in the Roth IRA. It doesn’t matter if you make $5 a year or $5 million. Inside of a Roth 401(k), you can maximize your contributions, which if you’re 50 or older is $24,500 in 2018. If you’re under 50, it’s $18,500. You can sock away a pretty good chunk of change every year in that Roth 401(k) option. That’s the first reason why I think people just don’t realize they have access or the ability to contribute to the Roth 401(k), but yes, yes you can. The second reason why is that most business owners are absolutely desperate. The potential harm of the long-term payoff of having Roth 401(k) assets that aren’t taxed again, they’re forgoing that. You’re forgoing that, people, in favor of a tax deduction today, which may not be the wisest choice. That’s kind of a twofold reason. 1) Don’t know that it exists, don’t know that I could actually make Roth 401(k) contributions regardless of my income, and 2) I’m shortsightedly thinking about tax breaks today and not potential tax benefits in the future. That’s really why we see people not contributing to a Roth. I have two more reasons why you should consider the Roth 401(k) over your traditional 401(k) contributions. Any employer contributions like matching dollars, safe harbor contributions, profit sharing contributions, those will always be deposited into your traditional 401(k) bucket. You only have control to put Roth contributions from your own paycheck into the Roth. All those other contributions that you get from the employer side are always going to go into the traditional bucket. It makes a lot of sense to diversify. You’re getting these traditional contributions that are going in anyway. It actually makes a lot of sense to diversify and add something over here into the Roth bucket. The other reason why I absolutely love Roth 401(k) contributions more than traditional 401(k) contributions is another little quirk about Roths, and that is that there are no required withdrawals when you reach a certain age. You could let this grow and pass it along to your spouse & to your kids. Then at some point they will have to start taking withdrawals, but in your lifetime you actually don’t need to take any withdrawals at all from Roth accounts, which is pretty darn cool. All of this information is totally meaningless if you sit there and you do nothing. If it makes sense for you to start making Roth 401(k) contributions, don’t wait. Why are you waiting? Don’t wait. Do it today. Yeah, I know. I’m allergic to forms as well. I hear you, but the wealthiest clients we have, the most successful clients that we have are also the ones who are decisive and they take action. Be decisive, take action. If it makes sense for you to contribute to your Roth 401(k), what are you waiting for? Go out and do it! Thank you so much for watching. If you’re watching on YouTube, click the button below to subscribe to our channel. We would love that. You’ll get updates every time we post a new video. If you have questions about your specific situation, we offer a free 15-minute phone consultation where we’ll answer your questions. Should you contribute to a Roth, should you not? Considering your age, your tax situation, everything, and we can help you make the best decision for you.